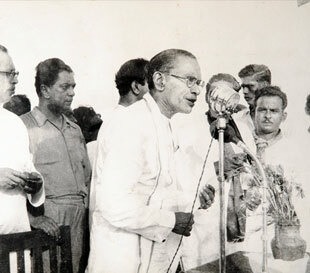 S W R D Bandaranaike was the fourth Prime Minister of Sri Lanka serving from April 1956, when his party, the Sri Lanka, Freedom Party, won a landslide victory at the general election, until his death at the hands of an assassin in September 1959. He came from a land owning family that had strong links with the British administration, his father Sir Solomon Dias Bandaranaike being a high ranking local official in colonial times to the British Governor. A charismatic leader and a brilliant orator, he soon made a mark in politics as a strong opponent of the colonial administration and a committed advocate of 'self rule’, indigenous culture and language. His vigorous defense of local causes led to his tenure as Prime Minister being called 'the age of the common man'. SWRD Bandaranaike’s impact on the political, economic and social development of Sri Lanka was of such a profound kind that what he left behind is not only yet remembered and revered, but continues to influence the core direction of State principles and policies. At the dawn of Freedom on the fourth of February 1948 in Independence Hall, as the Lion Flag was raised, as Leader of the House in the first Parliament, he proclaimed his vision of freedom as something that came alive only when the people had won not only political freedom but the social and economic freedoms too. His vision and indelible legacy rests on the fundamental premise that the PEOPLE - their lives, hopes and aspirations must come FIRST. For the people to truly be free and sovereign the State has a duty to provide basic human rights to the people. THE PEOPLE must have justiciable rights to freedom from ignorance, freedom from disease, freedom from want and freedom from fear. It was the obligation of the State to ensure these rights to all and it was his mission to enshrine these as fundamental rights in the Constitution. His untimely death in 1959 deprived him of this goal but the dream was fulfilled in the time of his widow Premier Sirimavo Bandaranaike in the Constitution of 1972. Graduates with Honours in Modern Greats at Oxford. Participates in University political life and wins election as Junior Treasurer at the Oxford Union. President of the ‘Majlis’ Society of Oxford. MEP wins two thirds of the seats under Mr Bandaranaike’s leadership. He is appointed Prime Minister and forms democratic socialist Government with a programme committed to change of direction. Three and a half years into his five year term Prime Minister Bandaranaike is assassinated in his private residence No 65, Rosmead Place, Colombo 7 by a hired gunman. The Samadhi was designed to occupy an area of two and a half acres accessible from the Colombo – Kandy highway near the twenty – fourth mile post. 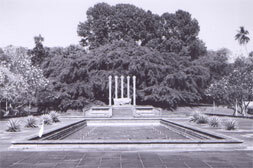 The entire design adopted for the Samadhi complex, was based on the ancient architecture of the Anuradhapura era, including the five eighteen - foot tall granite columns, depicting Pancha seela, visible against the large banyan tree in the background, under which the late Prime Minister used to play as a child and thereafter meditate, as an adult. The large, rough-hewn, natural rock weighing seventeen tons, placed in front of the five columns, depicts the rough and frugal life of the ordinary folk in Sri Lanka he preferred to follow, and the polished granite base on which the natural rock rests, depicts the comfortable cultural upbringing of his early life. In the foreground of the monument complex proper, is the extensive paved terrace, hundred feet in width and three hundred feet in length, four feet above the ground level, provided to accommodate a ceremonial gathering, with a reflecting pool in the centre as a feature, and landscaped by two avenues of Araliya trees with white blossoms, at the extremities of the complex.